Duck Washington's funny, engaging, personal, and very honest sketch comedy show about being biracial in America has traveled a long road to its current home in Bloomington. 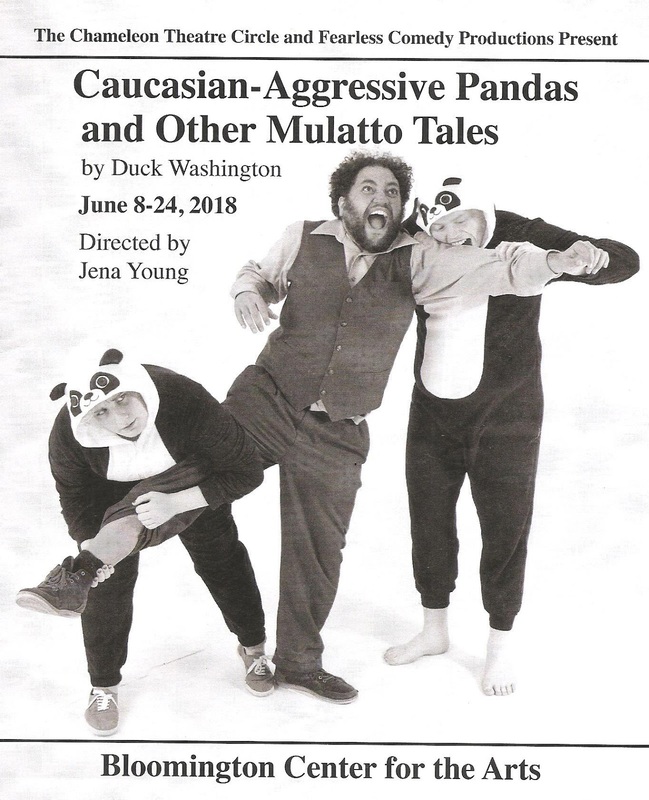 Caucasian-Aggressive Pandas and Other Mulatto Tales began as a Fearless Comedy show at Bryant Lake Bowl, and then had a successful run a the 2016 Minnesota Fringe Festival. Chameleon Theatre Circle originally planned to include the show as part of their 2016-2017 season, but the Ames Center in Burnsville, their then home, refused to allow the show to be produced there for fear that some might find the word mulatto offensive. To make a long story short (you can read more about it here), Chameleon left the Ames Center because they objected to artistic censorship, and Caucasian-Aggressive Pandas is currently being presented at the Bloomington Center for the Arts (the home of Artistry) as the final show in their nomadic 2017-2018 season. That's a whole lot of preamble for what is a very funny, insightful, and necessary show about race relations in America, which can only be improved by acknowledging it and talking about it, and maybe laughing about it too in a safe space like this. Oh, the irony! The show is constructed as a series of vignettes, introduced as chapters by the droll narrator (played by Matthew Kessen), along with a few asides in which Duck* speaks directly to the audience. The word in question is addressed early in the show, with Duck explaining its origins, acknowledging that it can be offensive to people, but like other offensive words, we can't just erase it from our history and pretend it never happened. That doesn't work either. What Duck does so brilliantly in this show is use humor and vulnerability to move beyond the fear and discomfort that often comes with talking about race to get to a place where we can be open with each other, listen to each other's stories, and empathize with people whom we perceive as different from us. Ensemble members Alison Anderson, Jason Kruger, Suzanne Victoria Cross, and Duck act out the sketches playing characters of various races, genders, and species. The narrator makes us swear "to laugh if we think something is funny, and not to judge others who laugh at something they think is funny." And there's a lot that you will find funny, like Duck's story of walking into a small town record shop and being approached by other customers who share with him their favorite black artists. And there are some things that you will not find funny at all, like he first time someone called him the n-word (playing basketball with a cousin when he was 12). But the serious is nicely balanced with silly, like the titular pandas who want to kill and eat white people, and an afterlife interaction. The show has not changed a lot since the last time I saw it, but it's a much different world than it was two years ago, which Duck acknowledges in an aside. In just over 60 minutes, Duck effectively convey a little bit of what it might feel like to grow up biracial (it's not always as bad as that episode of Oprah with Mariah Carey, which is reenacted). The conversation continues with a talkback after every show, which is such a great thing to offer, especially for a show like this that brings up a lot of issues and emotions. Open honest conversation, no judgments, and laughter. It just might change the world. Caucasian-Aggressive Pandas and Other Mulatto Tales continues at Bloomington Center for the Arts through June 24. For more funny stuff about serious issues, I also recommend Blackout Improv. This all-person-of-color improv troupe, of which Duck is a member, performs the third Monday of every month at Mixed Blood Theatre, in which they discuss issues or ideas suggested by the audience, followed by an improvised scene about it. *Ask Duck the origin of his nickname, it's a hilarious story involving spitting camels, racist Disney movies, and drunk theater nerds.